China is the world leader in chemical fertilizer production, consumption, and imports. Statistical data from the China Agriculture Year Book shows that fertilizer consumption increased from 12.7 million tons in 1980 to 50 million tons in 2010, with an average increase of 1.2 million tons annually. The pollution from fertilizer run-off continues to put pressure on drinking water, and aquatic and atmospheric ecosystems, which inevitably results in further soil and environmental deterioration. Thus, China is looking to find ways to reduce chemical fertilizer consumption and at the same time, increase its utilization efficiency. Here is where biochar fits into the mix. China has a long history of utilizing charcoal in soils—recently, scientists found charcoal in 4000 year old soils—and charcoal buried in the soil still plays a very important role in maintaining soil fertility. Since 2004, the research group at the China National Research Center of Bamboo (CNRCB) has been conducting different studies to explore the role of biochar in restoring deteriorated soils, improving soil cation exchange capacity (CEC), and reducing the amount of required chemical fertilizers. The team at the CRNCB realized that putting biochar in soils can be one of the solutions for reducing chemicals in soils and chemical run-off from fertilizers. Therefore, they looked into creating a biochar-based fertilizer and bringing it to market. The team had to address two questions before bringing the product to market: 1) is there an available technology for biochar production that is both economically and environmentally sound?, and 2) can the biochar product compare to existing chemical fertilizers in terms of effectiveness and price? In order to get the most economical and ecological biochar, three different models for manufacturing biochar have been developed since 2005: two are stoves (biomass energy-biochar gasifiers) and one is for large scale biochar production. The stove models differ from other existing stoves on the market in China due to their ability to offer the end user clean renewable energy in the home and the potential of a passive income through biochar. The stove is affordable for households or small companies. The flue gas analysis from these stoves shows that the concentration of CO in newly-developed models is less than 2000 mg/Nm3, while in other comparable stoves this value was between 5930-26670 mg/Nm3. 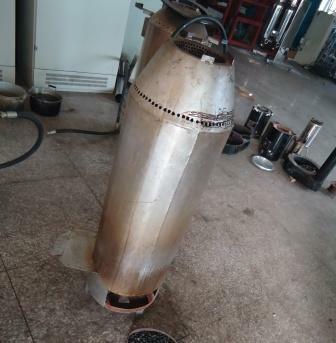 A partner in the research and development of the different biochar stove models is the Zhejiang Bulaimeng Agricultural Science Company. 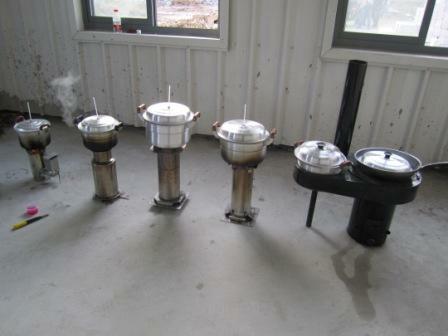 In October 2010, the stoves passed an environmental evaluation by the local Environmental Protection Agency, which meant that the company got a license for manufacturing biochar stoves. With the larger-scale manufacturing method, the team can produce biochar at a cost lower than 200 USD per ton, which is less than the price for urea. 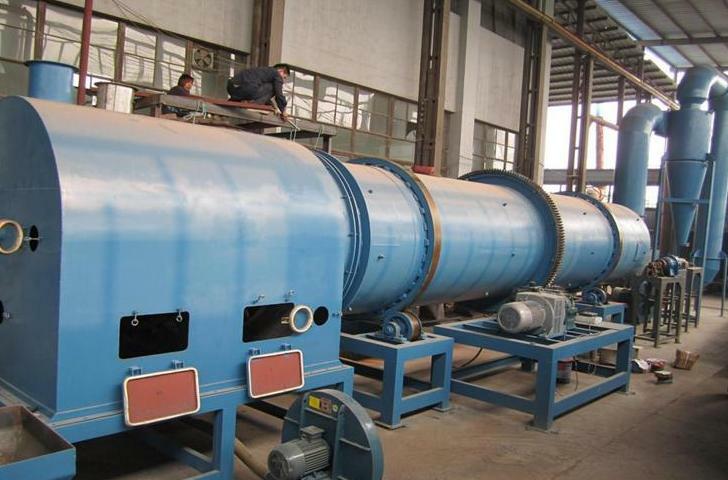 The main feedstocks are forestry and agricultural wastes, including bamboo. Their next challenge was determining how to get the product accepted by farmers as biochar application alone may not show a significant response in the first year or two on crop yield. Therefore, the team realized they had to be more innovative in their approach to get biochar accepted by farmers. They developed a biochar-based amino acid fertilizer, which is made up of biochar with some fermented organic material with high amino-acid content. After strict testing by the Zhejiang Provincial Office for Agriculture, the new fertilizer has tested percentages of about 16% amino acid, 55% organic C, 8% total N, 3% K2O, 3% P2O5, and 5.9 pH value. 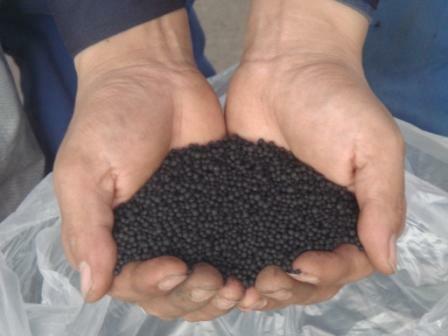 Just this month (February 2011), the new biochar-based fertilizer passed the government testing process and is now permitted to be produced for the market. The field trials show that the biochar-based fertilizer can significantly increase the N efficiency in soils, which usually exceeds 45%, while for the comparable chemical fertilizer this value is about 30%. With this permit, the Zhejiang Bulaimeng Agricultural Science Company has set up mass production manufacturing equipment, with a capacity of 20,000 tons/year. In addition, they developed a new inoculated seed-coating method. Field trials show that a small amount of inoculated biochar (used for seed coating) can be very effective in influencing crop health and yield. In trials, the biomass both above ground and underground increased significantly. Based on these achievements over the past 7 years, the China National Research Center of Bamboo is now focusing on the large-scale extension of biochar products in China. The Chinese Committee for Development and Reform is planning a meeting on biochar for late March 2011 in Hangzhou which will include more than 50 officials from the Central Government and the Provincial Government. 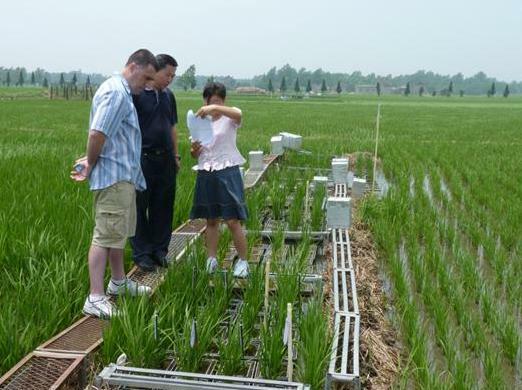 The attendees will visit the Zhejiang Bulaimeng Agricultural Science Company and the many field trials located in several counties in Zhejiang Province. For more information on this work, please contact: Prof. Dr. Zheke Zhong (Zhekez@yahoo.com.cn) or Mr. Robert Flanagan (rhtflanagan@gmail.com). Biochar-based amino acid fertilizer; all photos courtesy of Robert Flanagan and Zheke Zhong.